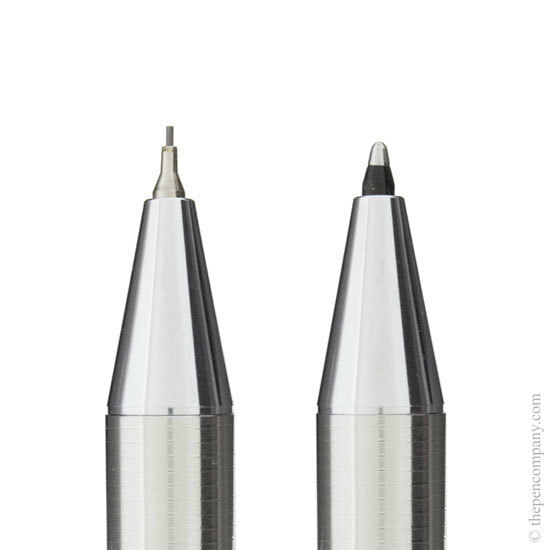 The Lamy st collection are manufactured from stainless steel with crisp clean modern lines. 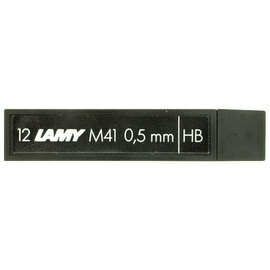 The slender Lamy st is available as a fountain pen, ball pen and as a 0.5mm mechanical pencil. 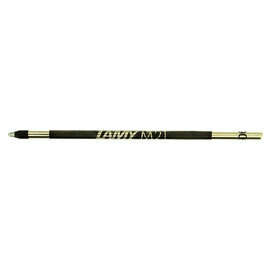 The st multifunction pens although greater in diameter then the 'standard' pens in the range are still admirably small. 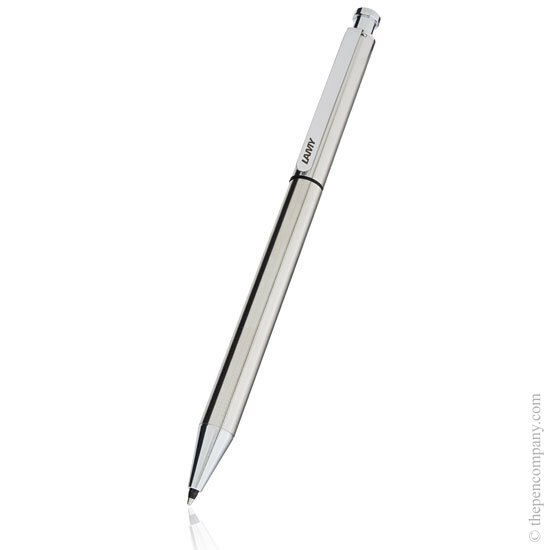 The st multifunction pens are available as twin or tri function pens with a wide range of permutations of functions. Great service. This is my pen of choice. I've lost one or two and find I'm lost without it. The pencil is particularly good as I sketch and make notes at every opportunity. The highlighter is useful too. This is my third one of these pens, they are excellent. Very slim and elegant for a three barrel pen. I prefer the matt black to the stainless steel, as the grip is better. Writes brilliantly. This is my second Lamy ST pen as I wore out the first one. 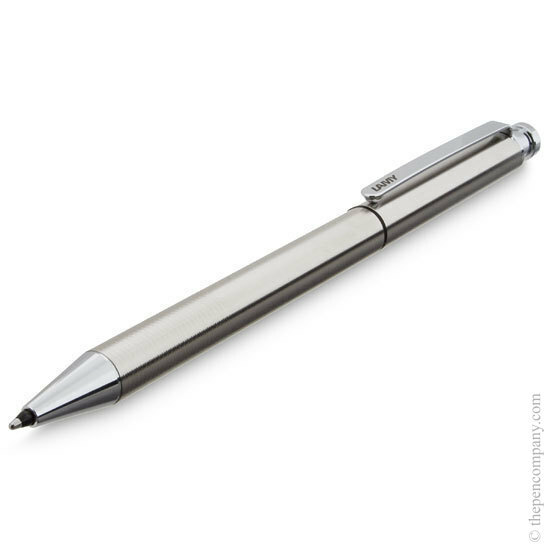 the Swiss Army pocketknife of the pen world. Buy it, you won't be disappointed! Love this pen. This is the replacement for the silver one I had but lost :-(. I thought that I might as well get one that is pen, red pen and pencil. I'm glad I did. It feels nice in your hand and it writes beautifully. 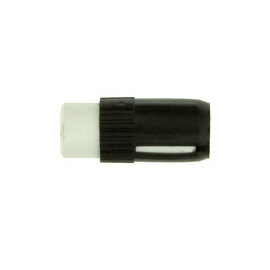 To replace the ball pen refills, unscrew the barrel (the join is just below the ring with the colour markers), then pull the refill out of the pen with a smooth but firm motion. You will find you are pulling against the spring in the mechanism, this is normal but can feel a little disconcerting the first time you try. 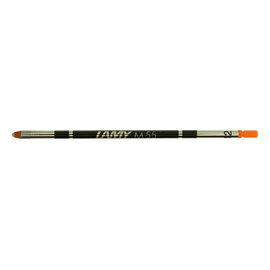 To replace the pencil leads, again, unscrew the barrel and then remove the pencil mechanism itself. It is best to grip the mechanism above the spring (the opposite end to the 'writing end') to avoid pulling the mechanism itself apart (if this does happen they simply push back together - just don't loose the spring!). You can then insert 2 to 3 leads into the mechanism and then push it back into place. Inserting too many leads causes them to get wedged in the barrel, resulting in them not feeding through, therefore, it's not recommended to put more than three leads in at one time. The eraser is the easy one! Simply remove the push button discard the old eraser and replace it with the new. To change the refill in the st multi-pen pen you simply pull it forward out of the pen - you are right in that you pull against the spring in the mechanism, which, can seem a little un-nerving the first time. However, this is how these pens are designed and you will not damage you pen doing so.